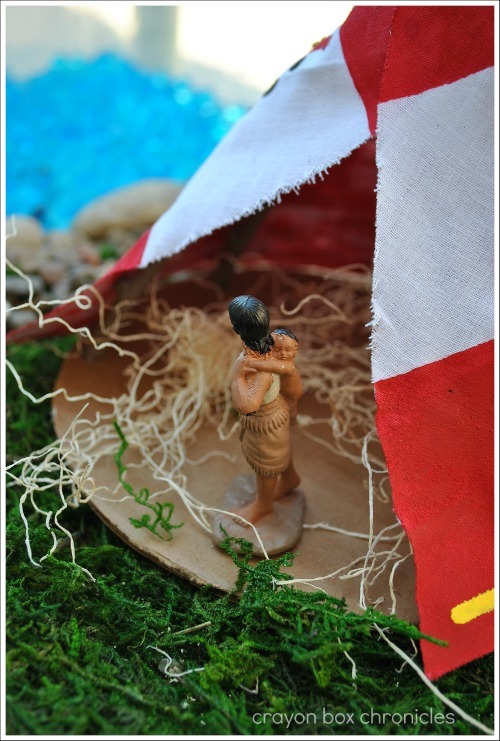 Today’s Native American small world focuses on different tribes, color symbolism, and general beliefs. 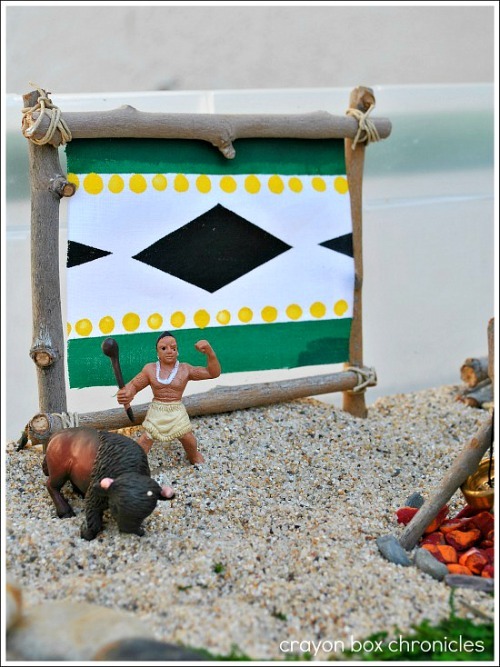 We’re part Seminole, so this will also be an introduction to part of our heritage for Little C. We even took our indoor small world outdoors to our rock garden! Our sensory materials include water beads, sand, rocks, moss, plus a homemade drum craft and hand painted teepee made from sticks. Native American culture revolved heavily around nature and Earth. Native Americans believe that everything is alive, and possesses an inherent virtue, power and wisdom. In the ancient culture and traditions of Native Americans, the meaning of animals was tied to the belief that animals, as spirit guides, walk through different stages of life with a person, teaching and guiding them, and in some instances protecting them. 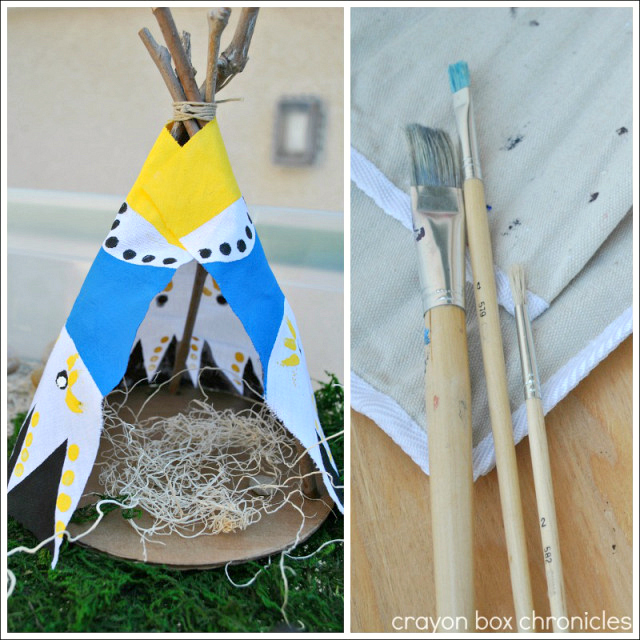 First, let’s begin with our DIY stick teepee tutorial. Let’s begin by constructing the base of the teepee. Above are the measurements and materials. 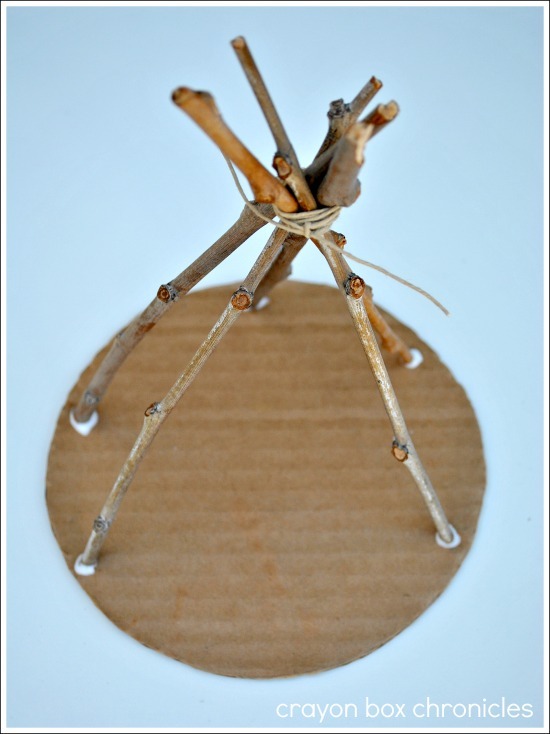 For the base of the teepee use a large 6″ diameter coffee can (3 lb.) to trace a circle then cut it out. The coffee can doubles as our homemade drum too. Make 5 holes, just slightly puncturing through. This will give the twigs more stability. 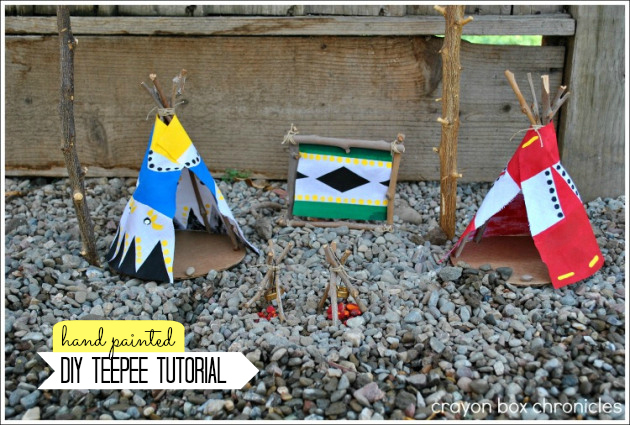 Be sure to leave a larger space in-front for the teepee opening. Tie the 5 twigs together tightly with twine. Dab white glue in holes and spread the twigs apart to fit in the holes. Re-secure the twine and add more if needed. Set aside the base and allow it to dry completely. Now let’s work on the shell. I used basic white fabric. 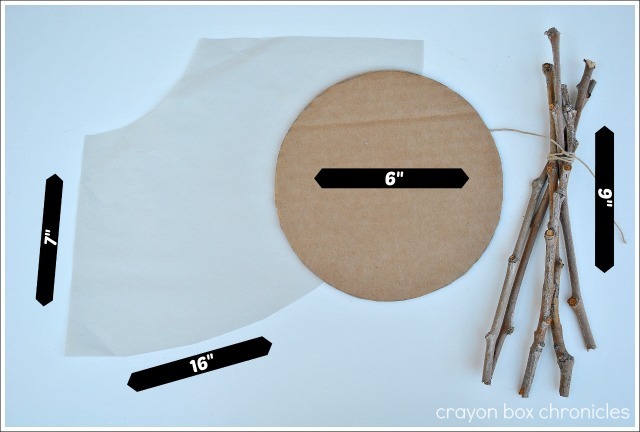 Cut your teepee shell using the above measurements 7″ x 16″. This will take some trial and error. If you want a larger or smaller teepee, just adjust your measurements. I practiced on paper first, then I used the template to cut my fabric. Once you’re happy, the fun begins. I used red, yellow, white, black, and blue acrylic paints. For the straight lines I used painters tape, for the dots I used q-tips, and everything else was hand painted. This is a super fun activity for older children too. I just love how all the colors really pop! Colors and symbols are an important part of the Native American culture. Native tribes told stories through the use of symbols and colors. Generally, they represented a large battle or hunt, identified different tribes, and played a spiritual role at ceremonies. Here’s an assembled teepee above. 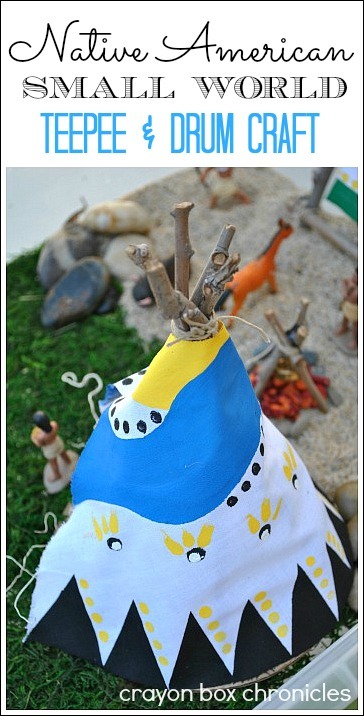 Once you’re finished painting the fabric, allow it to dry, then attach your teepee at the top using hot glue or tacky glue for kids. 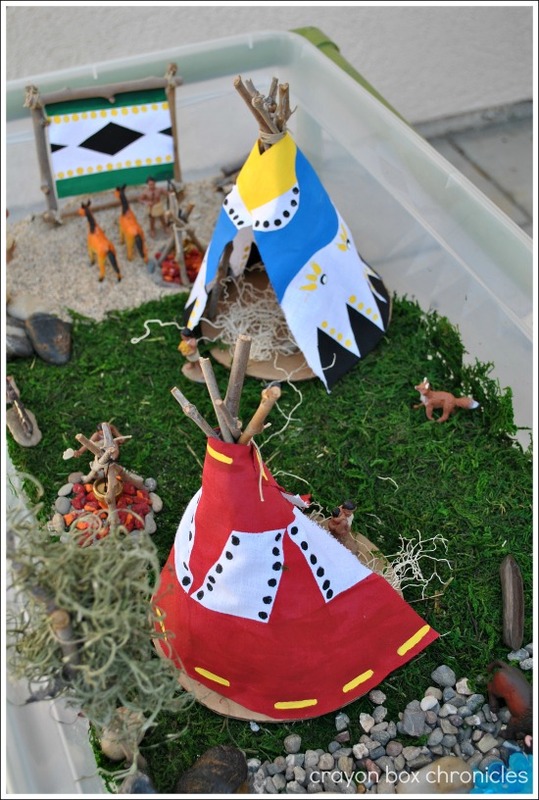 Let’s take a sneak peek inside our Native American Small World. 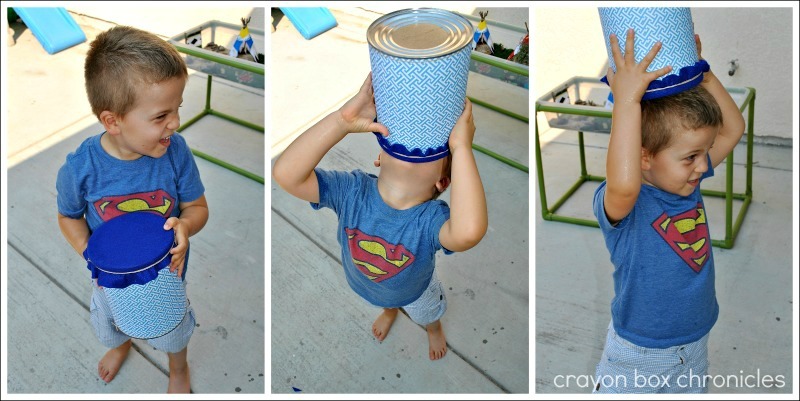 Before we explore small world sensory play, let’s construct our homemade drum. Drums played a very important role in Native American tribal ceremonies, celebrations, and spiritual gatherings. The drum is its own living entity, symbolizing a beating heart connected to the Earth. The sound calls upon the great spirits to open a pathway for negative energy to leave the body and positive energy to heal it. Different tribes have different traditions about their drums. For larger dances tribes would use a Powwow drum. Let’s have fun and make a “powwow” drum to play as we learn and embrace all the beautiful Native American Indian traditions. 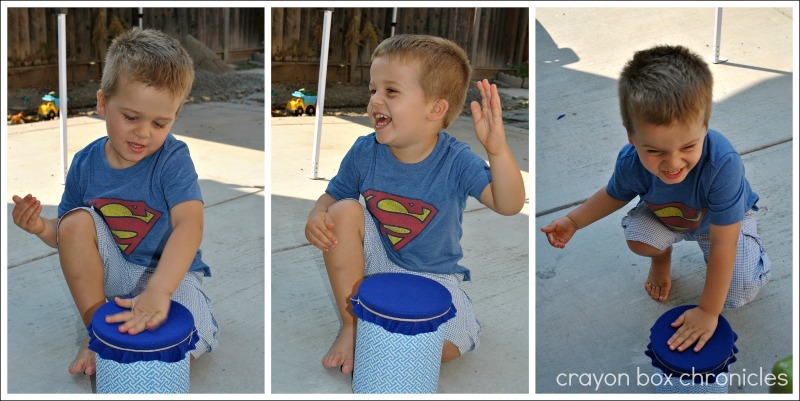 This drum is simple to make and lots of fun! The kids can join in the making-of too. Using the same can from earlier, cut paper to fit the can and glue it on. I used (2) 12×12 sheets of scrapbooking paper cut to size. Square a 8×12 sheet of felt to the lid and cut. Make sure you leave at least 2 inches of felt to hang over the sides of the can. It’s easiest to place the plastic lid on top, fold it over, and make a cut mark as a guide. 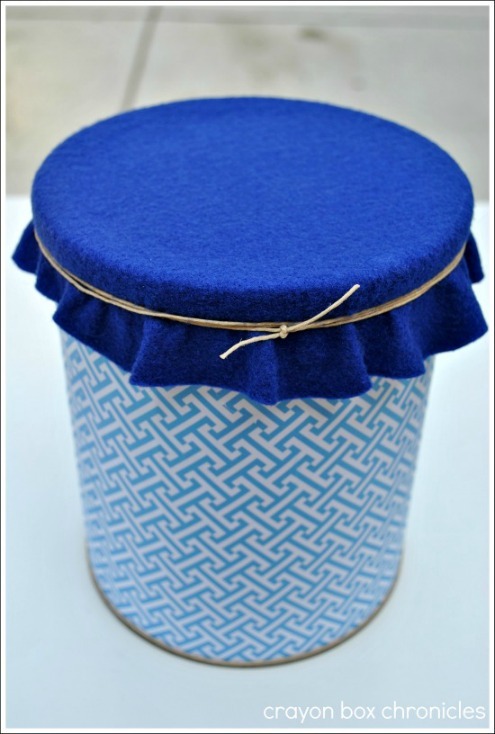 Glue fabric to lid and place back on coffee can. Place a rubber band around the fabric to use as a guide. Tie twine or yarn around the felt tightly. I cut off the rubber-band after the twine was secured and snipped the pointed ends of the felt off. Add feathers, beads, and ribbon to accent your drum. Sadly, we ran out of time, but we’re going to spruce it up this week! Start drumming! C used his hands and wooden spoons as his sticks! Little C is being silly with his new drum. 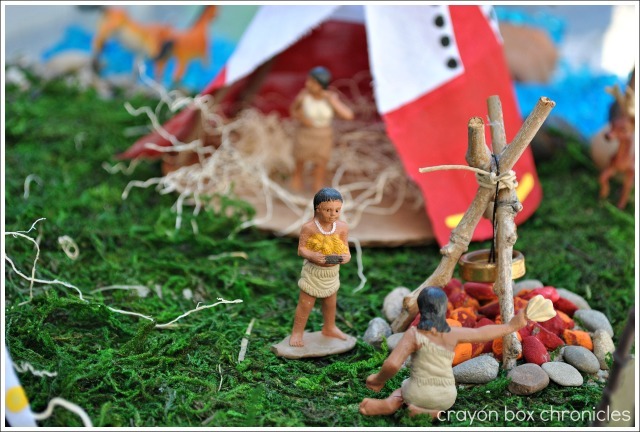 Today’s small world features Powhatan Indians figures which includes a Powhatan woman with baby, Powhatan woman cooking, Pocahontas, Wahunsonacock, Powhatan warrior, Powhatan hunter with bow, deer hide, dugout canoe, fox, deer, bear, and fire pit. Powhatan meant “waterfall” in the Virginia Algonquian language. It was originally the name of Chief Wahunsonacock’s home town. 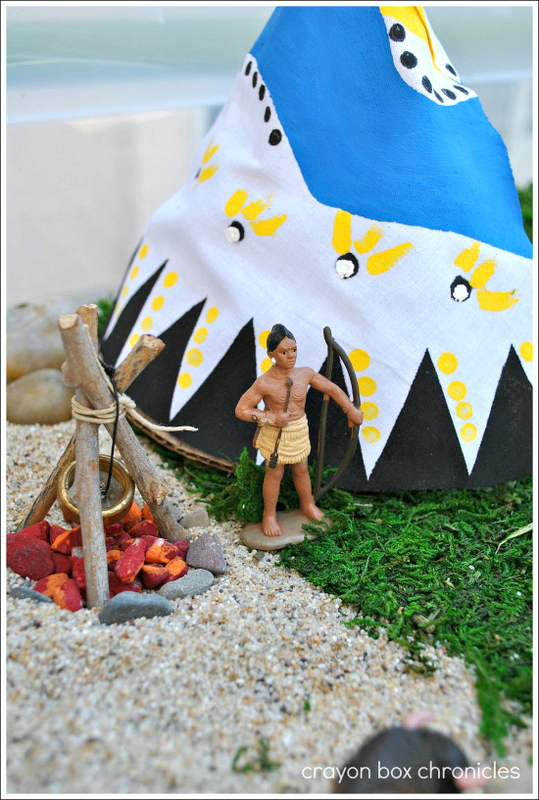 Specifically, Powhatan Indians didn’t live in teepees. They lived in small round houses called wigwams or in larger Iroquois-style longhouses. The Powhatan’s didn’t wear long headdresses like the Sioux. Typically, they wore beaded headbands with a few feathers in the back. Powhatan Indians painted their faces and bodies with different colors and designs for different occasions and often wore tattoos. As mentioned earlier, we’re discussing several tribes and animals. Wild West figures are also included, but we only used the buffalo, horses, and Native American figures. Emperor Wahunsomacock Powhatan is standing proud with his favorite daughter Pocahontas. This is my favorite picture! It reminds me so much of me and my son. I carried him for as long as I possibly could in a wrap. There’s something so special and sacred between a mother and child. I just love this capture and Native American traditions. In modern-day, we’ve adapted this same tradition with baby carriers and cloth wraps. A Powhatan woman is cooking near the red-hot fire stone coals. I assembled the mini-fire pits the same way as the teepee. Cut three small sticks and secure tightly with twine. I knew C would love the fire pits and want to move them around, so I added a small amount of hot glue at the top for extra security. The button resembles the “pots” made from stone and I painted the fire rocks red and orange. Behind her is the animal hide drying out. During winter months, Indians used the hides to keep warm. The bear is thought to be the master of the forest and is well-respected among Native Tribes. 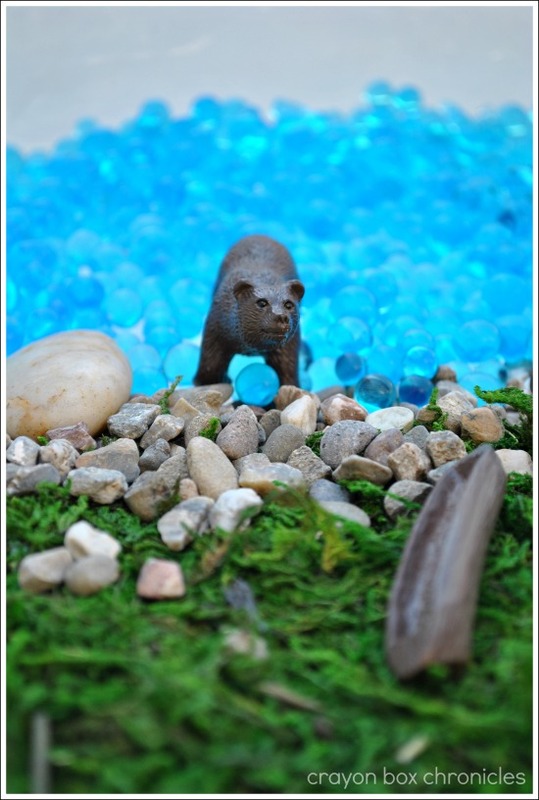 Many believe that when the Native American bear went into hibernation his spirit form would come out and roam freely. Animals are part of the sacred Earth and treated with the up-most respect. Native Americans would honor their spirit and use the hide for clothing and bones for tools. It’s unfortunate that as a people we do not have the same time-honored traditions today. Water beads are a great sensory material! It’s C’s favorite material to date. Bear likes them too. With C’s love for animals it was no surprise that he immediately went for Bear and Bull during play time. On water, the Powhatan’s used dugout canoes made from hollowing out large trees. Over land, the Powhatan Indians used dogs as pack animals. Traditionally, bows and arrows, lances, knives, hatchets, and clubs were not uncommon, by far the Native American spear was the weapon of choice for most tribes. Native American spears were hand-made and were often used as a status symbol amongst tribes. Powhatan warriors used tomahawks or heavy wooden war clubs. I love all the vibrant colors and textures too! This type of moss is a new material for our sensory bin worlds. It’s a moss mat. I highly recommend it for small world play because is thinner than traditional loose moss and the miniature figures can stand up-right on it. Horses weren’t introduced to Native Americans until the Spanish settlers arrived and taught them how to use them for transportation. Once adapted, horses became an important part of travel and trade. Eventually, the horse was the second animal to be domesticated by the Native people. Today’s small world play was full of history, traditions, and sensory fun! It was a nice introduction to teaching Little C about parts of our heritage and world history. The teepee and homemade drum will continue to be apart of his daily play time. I hope you enjoyed our journey today. Looking for more small world play? Happy drumming too! C just loves his drum! He used wooden spoons, a plastic drum stick, and his hands to drum. Native American information source Native Net and Indians.org. If you’re looking for more Thanksgiving crafts, here are over 95 awesome, easy crafts and activities for kids to explore. Are you following our Kids Crafts & Activities Board on Pinterest? Thank you so mcuh Lisette! You’re too kind! 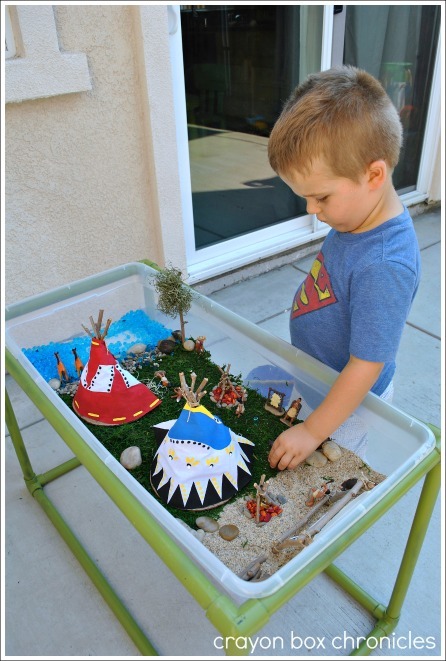 Love this small world play activity, so creative! We will be featuring your post on our Share it Saturday features this week, thanks for linking up! Hi Colleen! Awesome! Thank you so much for the feature and hosting!! :) Love Share It Saturdays! That’s so cute, it looks just like a museum up close! Thank you for linking up to Mom’s Library, I’ll be sharing this week at Crystal’s Tiny Treasures. Hi Crystal. Thank you so much! 🙂 And thanks for hosting too! Yay! 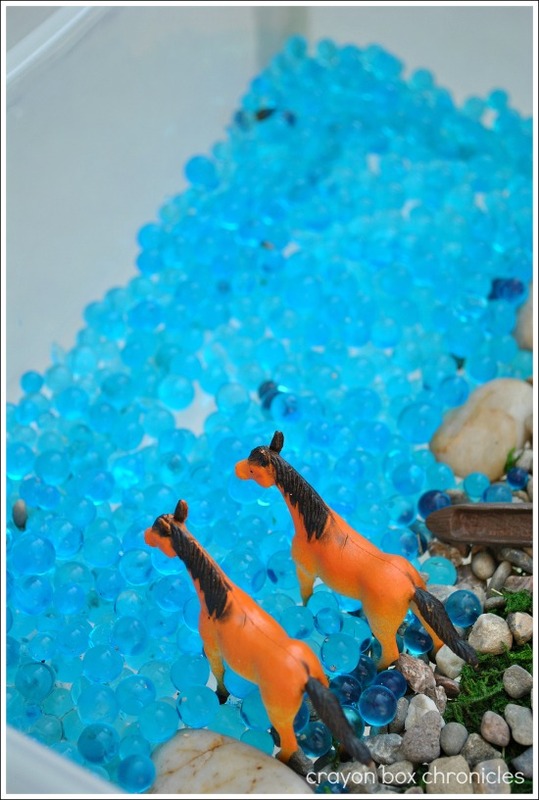 I featured this one in the sensory play party this week. I really enjoyed it and looks like your kids did too! Hi Deb. Thank you so much for your comments and the feature! Enjoy your weekend! Thanks for joining in the Outdoor Play Party. Lovely..all the detail is awesome! I work in a Headstart on Reserve program in Canada. appreciate how you used the term Native American. The First Nations people I work with dislike the term ” Indian” immensly and I still see it several times at this time of year with Thanksgiving coming up and such. 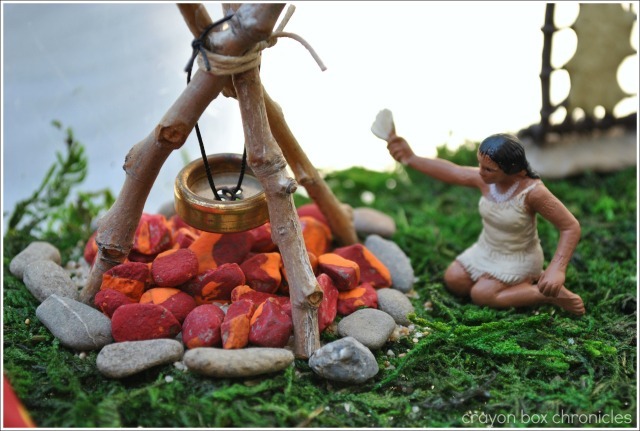 The Native Canadian band I work for didn’t use teepees but even the details on the rocks for fire and the three types of terrain are inspiring! Thanks for posting! Wow what an amazing job you did, I am so impressed. In fact so was my husband who is sitting next to me. Thank you for sharing on MotivationalMonday I have pinned this. 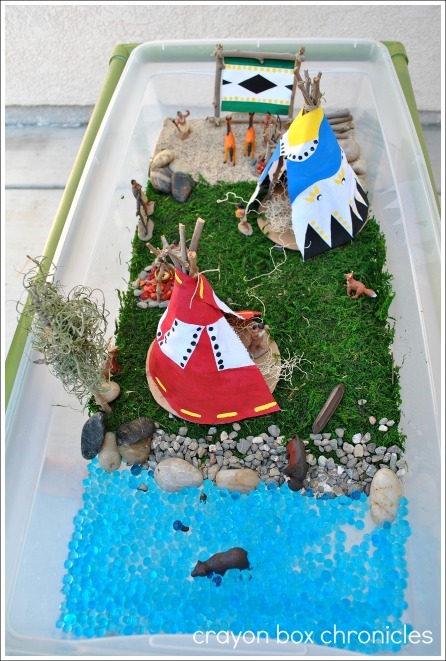 This is an amazing small world – so many details, all great for imaginative play! I’m going to remember this around Thanksgiving time; it’s perfect for teaching about Native Americans!